Yesterday we talked about love and gravity. How the emotion overwhelms and takes us by surprise. We also contemplated the powerful connection between mother and child being a mere microcosm of God’s vast, ethereal love for us. Today I want to share an influential God moment I experienced when my children were 6, 8, and 10 years-old. Although the power of the moment seized me at the time, looking back now – twelve years later – my heart overflows with awe, wonder, and gratitude over God’s Grace. His valuable lesson opened a vast window into self-discovery. Without going into details, a woolly mess described my life in many ways back in 2004. God knows when a Divine intervention is warranted, and His interlude tossed a buoy into my raging sea. While visiting a Marian shrine on a field trip with my oldest son, I spent some time meandering through the gift shop. A gentle hand tapped my shoulder, “Here. This is for you.” My eyes met with those of a petite, elderly woman. She smiled and pressed a card of some sort into my palm. My words trailed off in the back draft of her walking away. Dumbfounded, I hurried over to the register and paid for my item without even looking at the contents. I raced out of the shop with package in hand, scouring the grounds and parking lot in search of the mysterious gift bearer. She was nowhere in sight despite her slow pace which couldn’t have allowed her to roam very far. Discouraged, I found a quiet bench to sit and look at the item I purchased – a prayer card. The first five words unleashed a floodgate of tears. By the end, my heart raced and my soul ached. I knew deep in my bones the woman who gave me the prayer card wasn’t any woman. I will believe until my last breath I stood face-to-face with an angel. The prayer forced me to rest in the arms of Jesus when my heart was in shambles. Each word felt like a safe haven where I was able to cry out my deepest longings for my family. When we feel broken, exhausted, unglued as a mom or incapable of being the person our kids need, falling forward into Christ creates fresh air to breathe. And when we can’t make sense of our unorganized fears, desires, dreams, etc., the word of God unscrambles the mess, scripting the answers into literal context. God used this mysterious stranger on a field trip to accomplish this very thing by giving me a shot of mercy and relief through a prayer card. He allowed me to learn something about myself – I didn’t need to have all the answers. Pfff, half the time I didn’t even have the right questions! And when we don’t know what to ask or how to pray during certain seasons of our life, He willingly takes the burden off our back and fights for us. We need to stop dragging ourselves down by being our own worst critics because Jesus is always one thought away from being our own personal cheerleader. 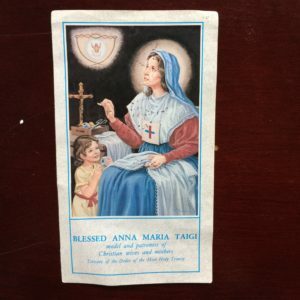 Jesus cheered me on through the story of Blessed Anna Marie Taigi. She was an ordinary housewife and mother, married forty-nine years who gave birth to seven children; three of whom died in childbirth. Despite her simple life, Anna became a Christian Mystic and was beatified in 1920. Her body still lay incorrupt in San Crisogono Church, Rome. May the words on her prayer card inspire your mom heart like they continue to influence mine. Lord God, bless my family. Make it a beautiful image of the Trinity. Inspire my husband to imitate your compassion and mercy. Let him be a humble servant who seeks only your glory and the good of our loved ones. Let him be a good guide, protector, provider, and – most of all – a builder for our holy lives. As head of our family, Lord, give him a loving heart that may never be domineering over those you have placed under his care. Inspire me, Lord, with a deep realization of my role as the heart of my family. Give me, as you gave Anna Maria Taigi, the fortitude to be an example of self-sacrifice and a means of reconciliation. Let me display the gentleness of Jesus and the love of the Holy Spirit. Give me the gift of wisdom, so that I may have the special intuition to discern your will in difficult family situations. Let me be a pillar of strength to my husband and a source of understanding to my children. Inspire, O Lord, my children to be thoughtful and loving toward me and their father, and may they be disposed to learn from the experience and the wisdom from their elders. Grant, dear Lord, that my family may stay together throughout self-sacrificing love, that every member be healthy and successful, that each be able to face any problem with courage and grow in your grace through prayer and trust in you. In Jesus’ name I pray. Amen. May we continue to fall forward, crazy Mommas!